Enviva’s Port of Chesapeake ensures the safety, reliability, and quality of our product. In January 2011, Enviva acquired a deep water terminal at the Port of Chesapeake, just outside of Norfolk, VA. The Port is owned by Enviva Partners, LP, and can host a wide variety of vessels, up to a 40 foot draft. The Port can receive, store, and load wood pellets for export and serves as the shipment point for woody biomass fuels manufactured at Enviva’s mid-Atlantic facilities, including the Ahoskie and Northampton, NC and Southampton, VA sites. The Port’s strategic location decreases transportation time and costs through the entire supply chain which greatly benefits customers. It enables Enviva to precisely control its product from forest to ship.The terminal completed construction and began operating in December 2011, less than a year after it was acquired. 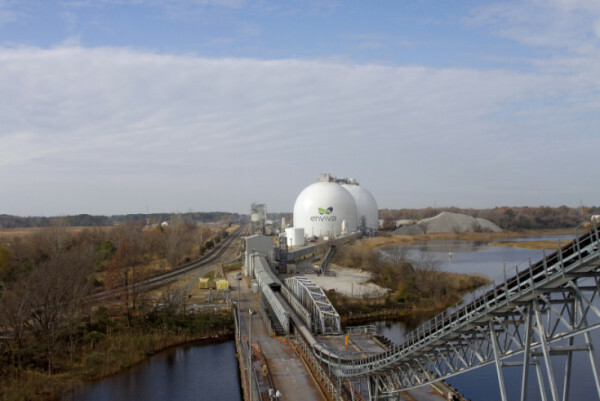 Enviva Port of Chesapeake has two wood pellet storage domes with capacities of 45,000 metric tons each. These domes have systems for continuously monitoring and controlling temperature as well as fire detection and suppression. They can also withstand hurricanes and winds of up to 300+ MPH and an 8+ Richter scale earthquake.